The Avebury "Swindon" Stone #46 Henge Inward Face marks stars to the side of the stars of Cygnus toward heaven's center at the fixed North Ecliptic Pole (which is not the same as the North Celestial Pole, which is not fixed, but in its position makes a circle around the North Ecliptic Pole in ca. 26000 years time). The present posting must be viewed together with the previous postings explaining and deciphering the other sides of Avebury Stone #46, as well as deciphering other stones. Our previous decipherment of the narrower "Swan Side" of the stone gave a clear result showing it depicted the stars of Cygnus at the top and the stars of Aquila below it. Hence, according to the decipherment logic applied successfully to other Avebury stones thus far, the henge inward face of the Avebury "Swindon" Stone #46 should mark stars neighboring to Cygnus in the direction of heaven's center -- and so it is. 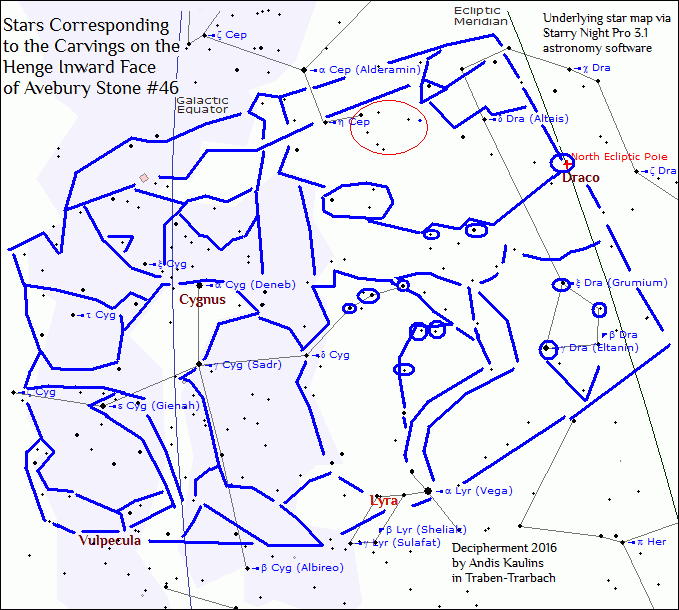 We were initially not happy, however, that we got so much "star" overlap between the Cygnus "Swan Side" stars and the stars of the henge inward face of Avebury Stone #46, but we had to take our results as we found them. A possible explanation is found toward the end of this posting. 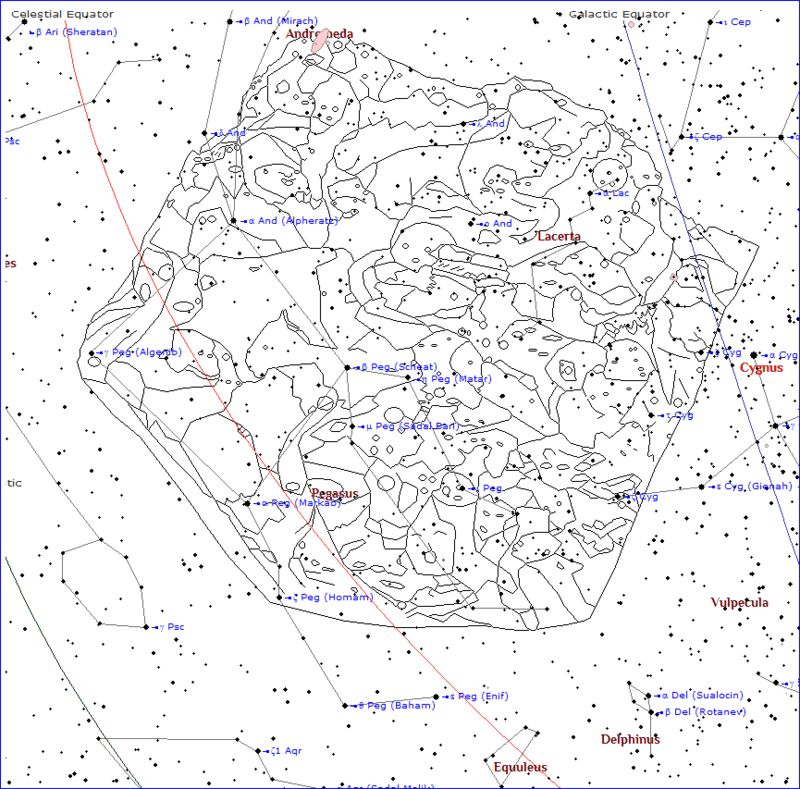 The red circle shows an area of the stone that was critical for determining which stars were marked on the stone. Note that the entire "face" of the stone also shows a human face profile looking right (the eye is just below the red circle, but the shape of that head is only of interest to us here in terms of the stars in the sky represented by the stone markings as a whole. 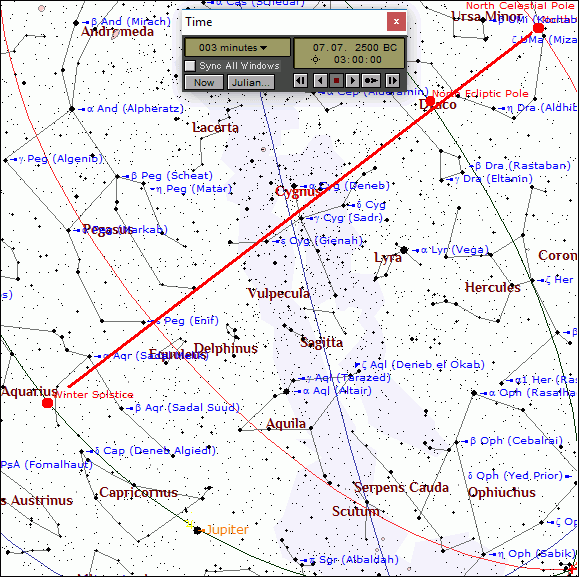 Note that the stars extend from Cygnus to the North Ecliptic Pole in Draco. The visual result -- just as on the opposite henge outward face -- once again appears to show a sled, but this time with the human at the front of the sled facing left and his various passengers and cargo to the back at the right. The "extended" Cygnus overlap of the above decipherment was puzzling. Why would the ancients have done that? Either we were wrong in our decipherment, or the ancients had something else in mind and did that overlap intentionally. We thought that the images had possibly interlocking edges in order to create "one" sledding picture as it were, and so we tried to interlock the decipherment images of the henge outward and henge inward faces. The resulting interlocked image is shown below, suggesting how Cygnus is still marked as a swan -- now facing right -- and permitting the two sledders to join together. 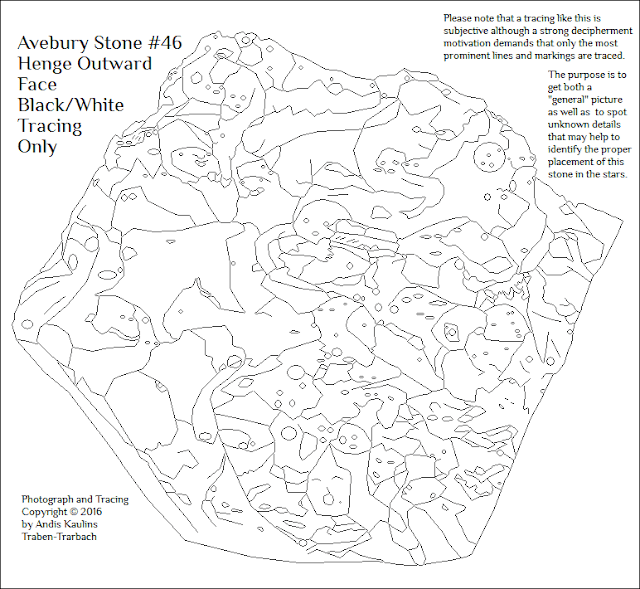 Avebury Stone #46 with Interlocking Decipherments of the Henge Outward and Henge Inward Faces - Note how there are numerous lines that seem to extend from one image into the other.... Recall that these are just "rough" drawings, and that drawings exactly meshing size, position and angle would produce even better results. Would the ancients have "joined" viz. interlocked the two stone faces in their carvings this way? We think it possible. The Avebury "Swindon" Stone #46 Henge Outward Face marks mostly stars in Pegasus to the side of the stars of Cygnus, the latter as located on the narrower "Swan Side" of the stone as previously deciphered. The Avebury Stone #46 henge outward face was a very difficult decipherment. Initially, one could perhaps "imagine" several figures in the above photograph, one could perhaps see a shape like a human head profile in the middle of the stone (virtually no other markings). Then there might be a human head or a big cat-like head in the upper half of the stone and a large horse-head at the bottom left with its body right, i.e. a big cat of prey attacking a horse. Probably not likely, but we wanted to mention it. A few other animal figures might be visible toward the middle of the stone -- with their legs at the lower bottom of the stone). Astronomically, however, there was nothing convincing to see. Indeed, even detailed tracing, which was repeated anew SEVERAL TIMES, gave in each case mostly an unsatisfactory result that looked like paisley patchwork. However, as noted in the previous posting, we are -- by the logic of previous Avebury decipherments -- dealing here with neighboring stars to Cygnus in an area of the sky where, except for the Great Square of Pegasus, there are no modern stellar constellations, precisely because of the lack of "prominent" easily imaginable figures. This decipherment was not going to be easy to see or prove. After many hours of study, a few minor details became apparent that offered points of reference, e.g. the alligator-like head at the top, the small horse head towards the middle and the bird-like figure to its left. Could that combination be found in that approximate form in stars near Cygnus? 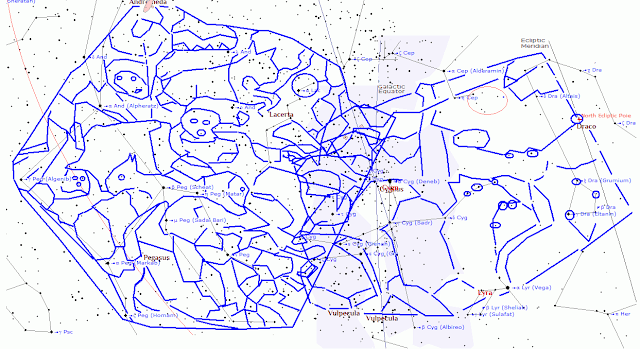 Using Starry Night Pro astronomy software, we tried various star fields near Cygnus and through trial and error overlaid them directly on our tracing of the henge outward face of Avebury Stone #46. Placement, angle and size had to fit. But did anything fit? 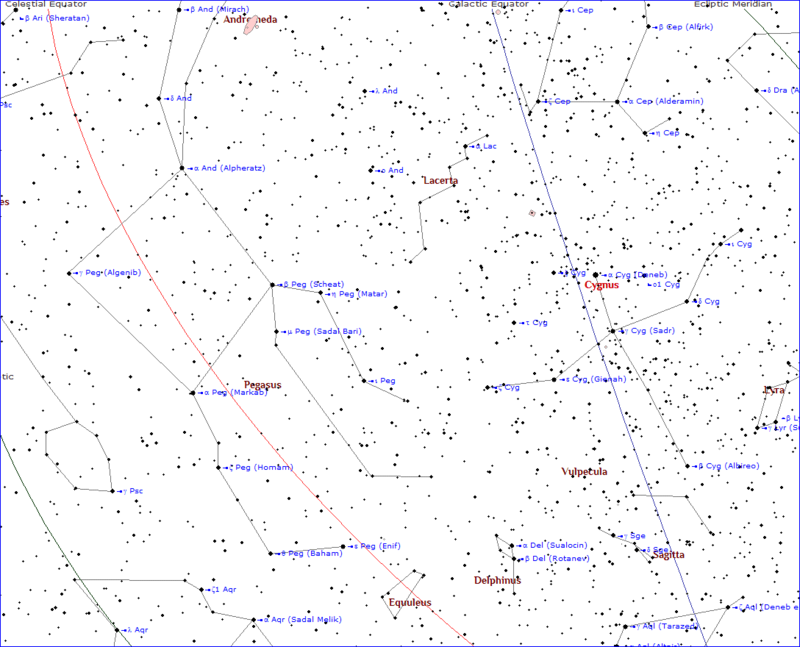 is of course not an exact match for a modern star map, even if the ancients too tried to maintain accuracy in the portrayal of the stars, also as to their relative distances, one from the other. No matter how this star map is overlaid on the stone, some parts are are wider, some thinner, but it proves close enough. 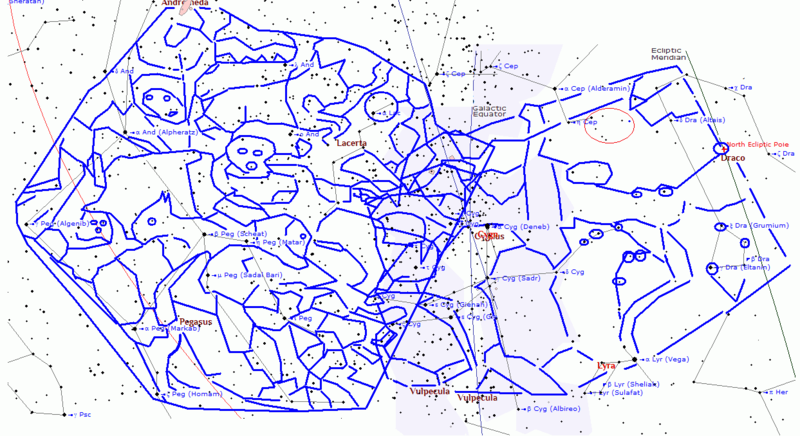 We overlaid that above star map on our black and white tracing of the stone. Check out there the alligator head at the top, the horse head towards the middle and the bird-like figure to its left. Of course, it took us a long time to get the approximate size, angle and placement right, but we did get the stars to fit. This was a difficult stone to decipher and we redrew all tracings and decipherment drawings several times, but the result always appears to portray a long toboggan-like family sled apparently carrying people, pets and provisions. The appearance of the sled would have been more of a surprise if we had not already found a boat that we thought might also be a sled (but unlikely in the summer) as portrayed on the henge inward side of Avebury Stone #10. Go there to take a look. "We see figures in our tracings of the most prominent lines on the henge-outward and henge-inward "faces" of the stone that could be interpreted to be people on sleds in the snow. Ancient sleds were, depending on the culture, also called toboggan, pulk or ahkio. 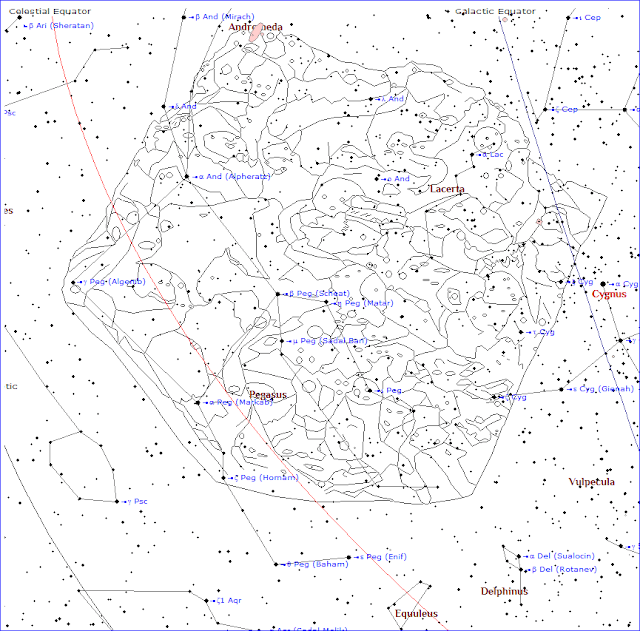 Especially the latter term ahkio is of possible interest because the stars marked here include the Great Square of Pegasus, known in ancient Sumerian (viz. Babylonian) MUL.APIN texts as ASH.IKU, whereby IKU is viewed as the term for "square" or "field". A toboggan-like sled might be found on the henge-outward face below the prominent human head profile, i.e. the figure would be sitting in that sled. The henge-inward face might at the front include a solo sledder lying face forward on a sled of the type that we all used for sledding in our younger days. The sledding explanation is, of course, not essential, and had nothing to do with our identification of the stars that correspond to the markings on the stone." In the era of the construction of Avebury, the solstitial colure (line) of the Winter Solstice in the stars ran through Cygnus, going through approx. Alpha Cygni in ca. 3100 B.C. and approx. through Gamma Cygni in ca. 2500 B.C. We add that solstitial colure below for 2500 B.C. 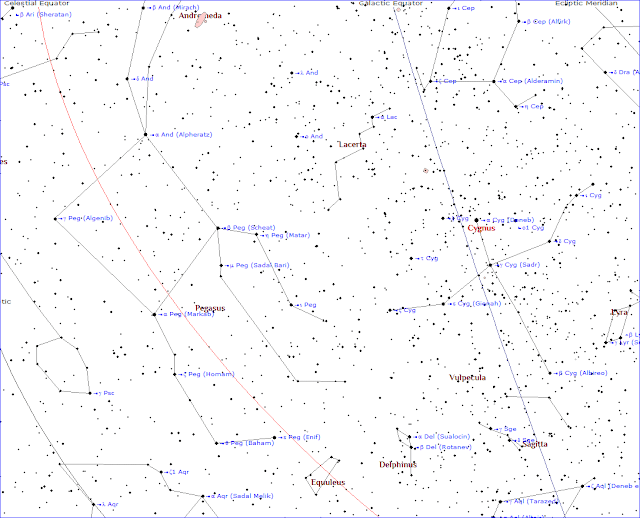 as the thick red line to the underlying sky map from the astronomy software Starry Night Pro 3.1, http://astronomy.starrynight.com. 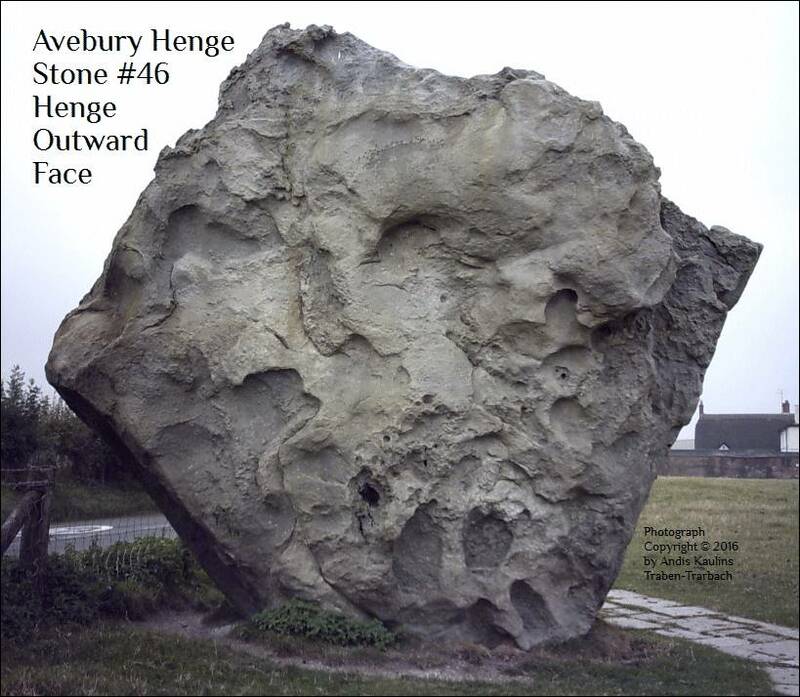 However, we remain of the provisional opinion that Avebury Stone #46 may in fact date back to ca. 3100 B.C. and thus may predate the full construction of the Avebury Henge complex, in which case the solstitial colure would have been "higher" toward Pegasus than here below. Gamma Cygni marks the "eye" of Cygnus on Avebury Henge Stone #46 as deciphered in the previous posting and also practically straddles the Galactic Equator. Note that the Cygnus side of Avebury Stone #46 is drawn exactly along that same Galactic Equator. 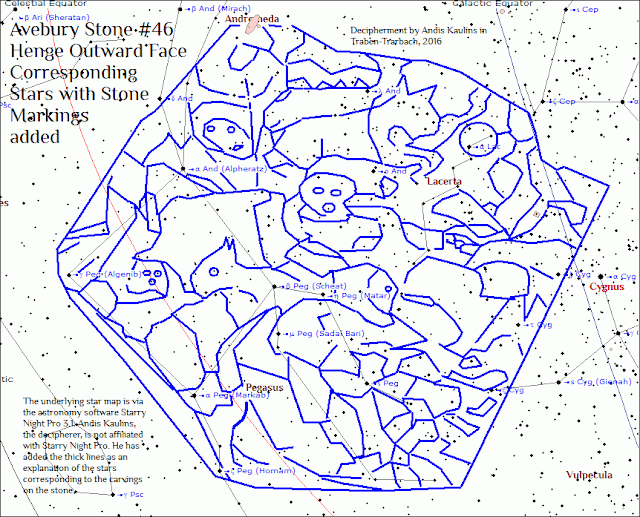 The large henge-outward and henge-inward "faces" of Avebury Stone #46 mark neighboring stars to the Cygnus side. These stars along solstitial colure pointed to the Winter Solstice and to winter weather. We see figures in our tracings of the most prominent lines on the henge-outward and henge-inward "faces" of the stone that could be interpreted to be people on sleds in the snow. The sledding explanation is, of course, not essential, and had nothing to do with our identification of the stars that correspond to the markings on the stone. The henge-outward face of Avebury Stone #46 was in fact particularly difficult to decipher because of the lack of "prominent" easily-identifiable figures in this area of the sky, and, indeed, except for the Great Square, modern astronomy has no constellations at all in this sector of the heavens. Thankfully, we were ultimately able to overlay star fields on tracings of prominent markings on the stone to arrive at solutions. 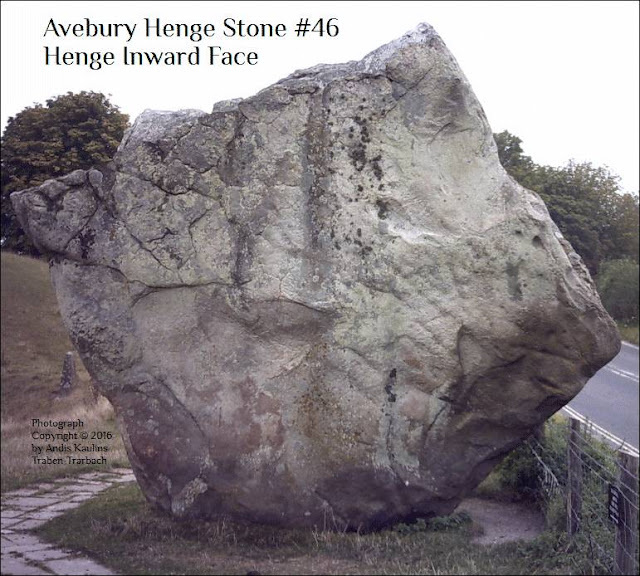 We present the henge outward and henge inward faces of Avebury Stone #46 separately in the next postings.